As a professional guitar maker for over a decade, I build mostly nylon stringed instruments in my workshop on Montreal’s South Shore. My study of classical guitar and lute are what brought me to instrument making (Drummondville Community College), in my quest to answer the fascination I had for the guitar and its tonal qualities. The beauty of the guitar, the satisfaction found in woodworking, the creativity, the manual dexterity required to build an instrument, combined with the complexity of acoustics are what finally led me to pursue my veritable passion and to define my future profession. I trained in stringed instrument making at l’Atelier du collège Édouard-Montpetit from 1997 to 2000, first as a student, and then as an instructor beginning in 2002. My path as a lutheir also provided me with an opportunity to work with seasoned artisans in both organ building and woodworking. Although my career path has allowed me to build and repair several types of stringed instruments, my expertise has been developed mainly around building nylon string guitars. The guitars I build are designed around the needs of the musician, the desired musical objective and specific ergonomic concerns. 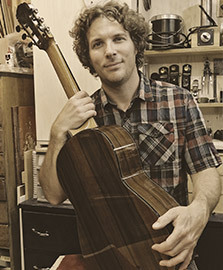 All my guitars are built and assembled by hand, in the spirit of the classical concert guitar. Classical in style and appearance, my guitars reflect the great importance I place on the visual aspect of each instrument. The aesthetics revolve around the species of wood and the particular details of the instrument’s parts. The aesthetics are sober, the lines simple and refined in order to showcase the beauty and sound qualities of the wood. I use decorative techniques particular to the traditional Spanish guitar and draw my inspiration also from certain historical instruments like the lute or the romantic guitar. Finally, I integrate modern elements to improve the ergonomics, the acoustics or the visual appeal sought after by the guitarist.